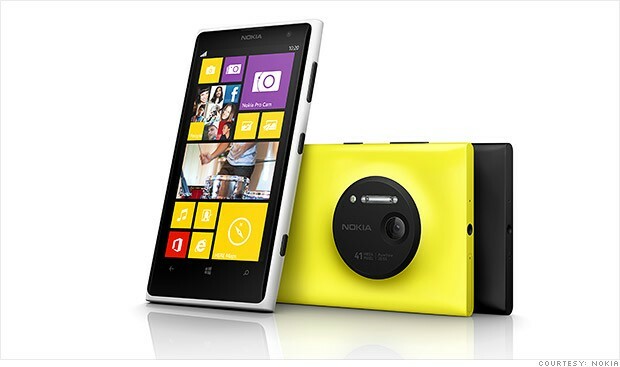 Today, Nokia officially announced the Nokia Lumia EOS, now called the Lumia 1020. It has a unibody design, similar to the previous Lumias. On the front is a 4.5-inch AMOLED PureMotion HD+ display 1,280 x 768 pixel display. Nokia’s also promised that the Gorilla Glass 3 display works well with gloves and is still readable in sunlight. The camera is a 41-megapixel PureView which takes full resolution photos along with a 5MP photo for sharing. It has 32GB of internal storage with no memory card slot, but you’ll get 7GB of SkyDrive cloud storage. It will go on sale July 26 as an At&t exclusive for $299.99 on contract or $659.99 off-contract. There’s an optional camera grip, which makes the phone feel more like a point-and-shoot camera than a phone. Also, wireless charging isn’t built-in like the 92x Lumias, instead, you can buy a separate cover that supports wireless charging. The camera uses a 26mm Carl Zeiss lens with an f2.2 aperture with ball-bearing OIS (optical image stabilization). It as a smaller flash for auto-focus assist and a larger Xenon flash. It can capture 1080p video at 30fps. The front camera is a 1.2MP wide-angle lens. They’ve also boosted the audio recording abilities with Rich Recording technology, which allows for distortion-free, stereo sound. It’s been said that the next version of Windows Phone 8 will support full 1080p resolution and a newer quad-core Qualcomm chip, which this phone is lacking since Microsoft’s mobile OS doesn’t support those yet. This phone comes with a 1.5GHz dual-core Qualcomm Snapdragon S4 processor.